It seems both an obvious and unassailable fact that children will suffer, sometimes acutely, from the loss of important figures in their lives; yet it wasn't long ago that such profound sorrow wasn't widely acknowledged. It wasn't until Freud—not Sigmund, but his daughter Anna—shed light on childhood grief that the subject captured the attention and validation of researchers. According to Andy McNiel, MA, CEO of the National Alliance for Grieving Children, an organization that encourages awareness of the needs of grieving children and teens and provides resources and education, Freud observed the effects of grief when working with Jewish children orphaned during World War II. Freud's observations, McNiel explains, influenced researchers, most notably John Bowlby, who went on to study how infants were affected by separation from their primary caregivers. "In recent years," McNiel says, "the debate over whether children actually grieve has been put to rest by such research studies as the pivotal Harvard Child Bereavement Study, conducted by William Worden and Phyllis Silverman." But despite the research, myths and misunderstandings persist, obscuring the needs of children in the wake of a significant loss. In order to help children cope with loss, both family caregivers and health professionals must recognize the misperceptions that stand in the way of providing children the same understanding and support that is offered adults in mourning. Despite recent research, misperceptions about the very existence of childhood grief persist. According to Mila Ruiz Tecala, LICSW, of the Center for Loss And Grief in Washington, DC, the notion that children are too young to grieve remains prevalent. "That attitude is a disservice to children since it deprives them of the ability to grieve." Research, she says, indicates that a child's core personality is affected by any loss during the early months of life. Losing a primary caretaker, however, especially the mother, "leads inevitably to changes in the daily routine that creates uncertainty and instability in the child's life." Even infants, says Jana DeCristofaro, LCSW, coordinator of children's grief services at The Dougy Center, The National Center for Grieving Children and Families, are affected when a primary caregiver dies. "They will know that the person who is holding them does not smell the same, feel the same, or carry them in the same way." It's also increasingly clear that not only do children grieve, but they also grieve in different ways or express their grief differently than do adults. "Kids often grieve in spurts because they can't seem to tolerate grief for long periods of time," says Susan Thomas, LCSW-R, FT, program director for the Center for H.O.P.E. at Cohen's Children's Medical Center of New York. Adults, she explains, "have one foot in grief and one foot on the outside, but kids jump in and out of grief." Children may give the appearance of coping well, when suddenly a seemingly innocuous event unrelated to the loss triggers a disproportional response. For example, says Thomas, "A child may scrape her knee and say, 'I wish Daddy were here. If he were here this wouldn't have happened.' Kids are masters at being able to distract themselves and focus on other things, but when something happens, all of the emotion they've been pushing away comes back." This coping mechanism, Thomas says, allows them to "handle the intensity of the experience." Not only may children and adults grieve in dissimilar ways, but, McNiel says, "Children also grieve in different ways at different ages and stages of life. Their grief might be expressed in an array of emotions such as anger, sadness, fear, and sometimes relief, particularly when there had been long-term illness or perhaps a contentious relationship with the person who died." It's important to remember, however, DeCristofaro says, that when it comes to grief, those developmental stages are fluid and permeable. "Sometimes you'll see a 3-year-old grappling with something existential as a teenager might." "Grief does not happen in nice, neat stages, but is unique to the person grieving and influenced by a number of factors in addition to age, including temperament and personality, the relationship they had with the deceased, the relationship they have with the surviving caregiver, the type of death, and the reaction of the adults around them," McNiel says. Grief, he adds, is not very well structured, and all children, like all adults, grieve in their own ways. Many adults, Thomas says, may believe that if children are not visibly grieving, they're not grieving. "Grief is the internal response and mourning is the external response to loss. Kids may not be showing grief on the outside, but they're grieving tremendously on the inside." When a death occurs, children, like adults, Thomas explains, "go into a shocked, numblike state. It seems as if a shutter comes down in our brain, protecting us from the intensity of the grief experience, and as the weeks and months go on, that shutter slowly goes back up. However, with children, that shutter seems to stay down a bit longer." Children aren't likely to exhibit intense reactions early on, even in the first year. "But that doesn't mean that down the road they may not have some intense reactions," Thomas says. In addition, grieving is cyclical. "As kids reach new developmental levels, they're going to reintegrate aspects of the grief process using newly acquired processes and skills. Kids will regrieve these important losses at different times in their lives. For example, a girl who loses her mom may have more intense grief reactions at key points in her life such as when she starts to develop physically, when she goes out on her first date, goes to the prom, when she gets married," Thomas says. It's not always possible for adults to accurately perceive whether or how a child is grieving. Adults may expect to gauge emotion through tears or verbal expression of emotions. And while those may be present, children will behave in different ways and often in a manner that may not outwardly appear to adults to manifest grief. "Kids will have a wide range of reactions, just as adults do, from sadness to anger to rage to confusion and relief," DeCristofaro says. They may use more than their verbal language to communicate their feelings, she says, also expressing their emotions, for example, through art or play. Adults, she says, must recognize that just because children or teens don't verbalize their feelings, it doesn't mean they are not missing the deceased or feeling sorrow. Depending on the child's age and level of understanding, Tecala agrees, grief may variously be expressed in vastly different ways, in one child by acting out and in another by silence and withdrawal. As children and teens grapple with what it means to die and struggle to comprehend death's permanence, Thomas says, they may exhibit regressive behaviors such as bedwetting, thumbsucking, separation anxiety, feelings of insecurity, and needing to sleep with parents, especially younger children. "The older they get, the more able they are to understand death and they begin to be able to express their grief more in words, but the younger they are, the more grief comes out in their behavior. Older children may exhibit anger, aggression, or risk-taking behaviors," she adds. Among the reasons children may not verbalize their grief is that they take cues from adults. "They may not feel safe because no one has asked them," DeCristofaro explains. Sometimes, within the family, the child gets signals that talking is wrong or hurtful. They notice or fear that if they bring up the subject they'll create more sadness and more tears. "Adults might assume that children are better off not thinking about or talking about the person who died. They might remove pictures or avoid talking about the deceased in the presence of children," McNiel says. In response, the children will retreat in silence. It's not uncommon for children to experience feelings of guilt following a loss (particularly when the deceased is a parent), triggered by the perception they may have somehow contributed to the death. "Because children are ego-centric and view life through a 'magical' lens, they will often feel that they somehow caused the person to die," McNiel says. They may feel that if they'd been better behaved the parent would still be alive, or that there was something they could have done to prevent the death. This guilt may arise as well if a child had quarreled with the person before the death and concluded, "I wished him dead and it happened," Tecala says. "It's magical thinking, but it can create havoc in a child's psychological well-being." When those around the child encourage silence and fail to allow the child the freedom to express these feelings, they may persist. They'll need a lot of reassurance, DeCristofaro says, to understand that they didn't influence events and that there was nothing they could have done to prevent a death. It doesn't help to prevent children from discussing their feelings, but, on the other hand, it's also not helpful, McNiel says, to force children to talk about or express their grief. Another persistent myth is that the truth is harmful to children or that children are too young to handle the truth about how a person died and about what it means to be dead. "This doesn't protect a child from grief, it only leaves the child to grieve alone," McNiel explains. Younger children may have little understanding of what death is and what it means. This confusion, says DeCristofaro, "can get compounded by the use of euphemisms such as 'we lost him,' or 'he expired.' The things we say to soften the experience can be very confusing." Experts agree, the truth is preferable to lying, which fosters mistrust, and clear language can help a child better understand the phenomenon of death and its permanence, as well as the particulars of an individual loss. At the Dougy Center, adults are encouraged to use concrete language when discussing or explaining death to children. "It's painful for adults to share information, and they may be fearful about how the child is going to respond," DeCristofaro says. But children need to understand, when a person dies, "that the person's heart stopped, that he doesn't breathe or sleep anymore, that we won't see him again," DeCristofaro explains. "Certainly one should consider a child's age in sharing age-appropriate details, and there is no reason to share gruesome details, but whatever is shared with a child should be built upon the truth. When the caregivers in a child's life establish open dialogue about the death, the child often will return with more specific questions as he or she clarifies his or her understanding of what happened. This is true in the case of suicide and homicide as well as other types of death," McNiel says. • Children should not be forced to participate or to talk about the person who died. • They should be prepared about what they might see or hear when participating and then given the option of whether to participate. • A plan for an early departure should be put in place in case the child should become overwhelmed and ask to leave. As with adults, grief in children doesn't have a timeline. But while adults may be able to begin to come to terms with loss within a relatively brief time, children, Tecala says, cannot do so until they are in their mid-20s. "It is only at that time that their brains are fully developed that they have the ability to complete the process of reconciling to the death." They not only need to be given the time to cope, Tecala says, without being made to feel baby-ish for having difficulty adjusting to a death but they also need to be supported throughout life stages and when issues resulting from grief reappear. It's important, DeCristofaro suggests, "to dismantle the terminology of 'getting over something.'" It's a process one goes through, but grief, she adds, doesn't have an end. "Grief," McNiel agrees, "is not a problem that one needs others to 'fix' or 'solve' or even 'get over.'" It is instead a process that lasts a lifetime, as does one's relationship with the deceased, which rather than ends, transitions over time. Children and teens may need guidance and support for taking on the tasks of mourning, the most important of which initially is absorbing and adapting to the most basic fact that someone has died and will not be seen again. "After the death of a significant person in their lives, children begin a process of adapting to that person's absence," McNiel says. Grief, he explains, is the normal consequence of acknowledging that their loved one no longer physically exists. "Their relationship with the deceased person moves from one of physical reality to one of memories and continuing bonds." While there may not be clearly defined stages of grief, there are additional common challenges for children in the aftermath of a death. These tasks, which are highly individual, McNiel explains, were formulated by Worden after he completed the Harvard Child Bereavement Study with his colleague Silverman and have been addressed by other scholars. They include learning to cope with emotions and other changes resulting from loss; developing a new type of relationship or attachment with the deceased based on remembrance; finding meaning from the experience of loss; and reinvesting in life, moving forward, and absorbing the experience into their lives. Even kids, says Thomas, are capable of searching for meaning from the experience of death. The death of a loved one, DeCristofaro says, "is one of the most holistic experiences one will have." Its effects, she says, are cognitive, emotional, spiritual, behavioral, and physical. While many children adjust well and are able to grieve over their losses, some children may have greater challenges. "Children might struggle with concentrating in school or react in anger, demonstrating an array of problem behaviors," McNiel says. "Often the lack of concentration might be misinterpreted as ADHD or ADD. Children might misbehave at home in ways not typical of their behavior before the death, testing out their new reality," he adds. Many children and teens experience isolation after the death of a loved one and may feel that they stand out from their peers, particularly if no one else among their friends or schoolmates has had a similar experience, DeCristofaro explains. As a result, they may be at greater risk of anxiety and other mental health challenges, substance abuse, and the physical aspects of grief, such as colds, coughs, and stomachaches, she says. When children are not helped to grieve at every stage of their development, Tecala says, they experience cumulative losses. Among the consequences may be behavior problems such as depression and drug and alcohol use. Not all children will require help adapting to loss beyond that which their family can provide. But in many cases, children will benefit from ongoing support from social workers and other counselors, from support groups, and from peer programs and other grief counseling. Social workers, thus, may be key players who can help children navigate the tasks of mourning and prevent complications that arise from unaddressed grief. To help facilitate grief, social workers should be alert to issues and behaviors that might suggest that a child is having difficulty coping with a loss, whether or not they are seeing a patient specifically for grief. "I always say one doesn't have to look at it in terms of problems you can diagnose, but rather look at the issues the child is going through now that may be red flags," Tecala says. 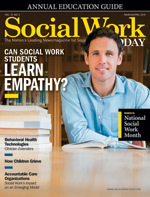 Social workers can best assist families by starting with honesty and transparency, DeCristofaro says, "helping children understand who died and how they died, helping parents and adult caregivers feel confident sharing information and fielding questions, and listening—to … ask kids questions and give them choices." McNiel observes that social workers will need to be patient, "as grief is a lifelong experience for children, and they will come in and out of their grief as they grow and develop into adults." It's helpful, he says, to offer children choices throughout the course of grieving, "from the time of a funeral and when providing support long after the death." There's no single strategy that will ensure that a child can cope with loss, but a variety of options may be helpful, including art, play, crafts, and memory projects. "Children will move toward those activities that feel most comfortable to them," McNiel says. Social workers can help, experts agree, by being aware of and avoiding assumptions. "Avoid projecting your own grief onto children and giving advice. Assuming that we know how they feel (even if we had a loss at their age) can highjack their grief, making it more about us than about them," says McNiel, who adds, "Let the child lead you, listen, be present, and follow them in their play." In the end, Thomas says, children can teach social workers and other adults about their grief experience. "We know a lot as social workers, but everybody's grief experience is different." Listening and allowing children to express themselves in their own way and at their own time is key. Social workers and other caregivers can find useful information at the National Alliance for Grieving Children's website (childrengrieve.org) about the needs of grieving kids and teenagers, along with links to numerous resources, including bereavement support programs across the country. Information is also often available from hospice programs, local funeral providers, and children's hospitals, says Andy McNiel, MA, CEO of the National Alliance for Grieving Children. • The Centering Corporation (www.centering.org).